This time honored classic is a true parent ‘must have’ and a baby ‘go to’. Its maze of soft, continuous tubes and its stunning colors instantly capture and hold baby’s attention. 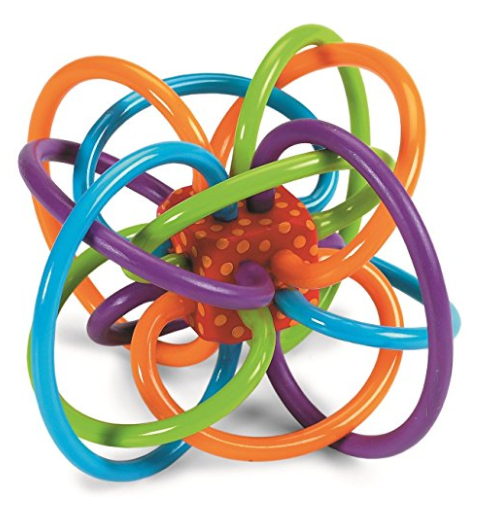 The mesmerizing loop design and lightweight construction make it very easy for little hands to grab, hold and rattle. The soft, pliable BPA-free teething loops are perfect for teething or gumming babies. The center cube features a quiet rattle so baby can explore sound and cause and effect. Winkels are lightweight and the continuous tubing makes it very easy for little hands to grasp and shake. Each Winkel contains quiet rattling beads inside the center piece that are loud enough for baby to explore auditory cause and effect, but never annoying for caregivers. Winkels are suitable for newborns and up. The colors and the unique shape will intrigue infants as they learn to track and turn their heads. They’ll be eager to touch, lift and shake this mesmerizing maze as soon as their little hands are able. Winkels are ingeniously designed for teething and gumming babies. Babies can get a strong grip on the PVC and BPA-free teething loops. Winkels are durably constructed to handle even the most rigorous teethers, and can be refrigerated to provide relief to sore baby gums. Since 1979, Manhattan Toy has been making high quality, whimsical toys for kids.